The thermal barrier coating (TBC) system is one of the most important technologies to improve the durability of mechanical components operated under extreme environment. In this study, we have conducted 3D finite element analysis to investigate characteristics of the residual stress distribution over a TBC system. It is simply modeled as multilayer thin plates consisting of base metal, bond coating, and top coating. Heat transfer analysis determines the temperature distribution which is the input of the following thermal stress analysis. Simulation results show the residual stress distribution to both transverse and longitudinal directions as well as plastic strain distribution. 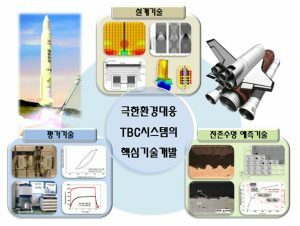 This analysis will be indispensable to developing core technologies for the TBC system such as optimal design, performance evaluation and residual life prediction. Ever since the nuclear power plant was built, it was necessary to evaluate its safety from breakout. From the latest event of Fukushima, we can see how vulnerable the nuclear power plant is, to severe earthquakes. Seismic design is for a study on the validity of piping interface design under base isolation system versus non-base isolation system. This simulation is helpful to secure safety of nuclear power plant when natural disasters occur. 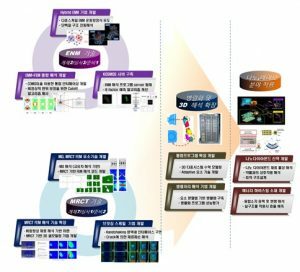 Elastic network model based Protein simulation can elucidate the relationship between protein structure and function which might be one of the most fundamental techniques for next generation drug design, so we developed KOSMOS (Korea SKKU Morph Server) which is an automated online server for protein dynamics. Using this server, we not only construct a database including dynamic features of the whole known protein structure but also elucidate the misfolding mechanism of human inherited disease proteins such as antithrombin and amyroid beta protein. In the future, this server and database will be a corner stone of protein structure based drug design. 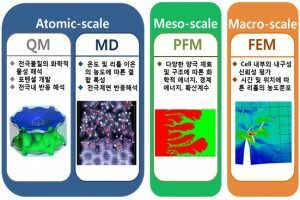 Development of Multiscale Multiphysics Simulation by integration of discrete and continuum modeling approaches for nano and bio enabling material design such as nano diamond based drug delivery system and nanostructure design by DNA self-assembly. To realize our research goal such as multiscale analysis system development and its parallelization, the following major works have been done successfully during the third year, resulting in 8 SCI journal papers, 4 accepted papers, and 2 more papers under review: 1) KOSMOS online server for protein dynamics, 2) Mass-weighted chemical elastic network model, 3) CNT vibration characterization, 4) DNA Tile self-assembly simulation, 5) Atomistic simulation for graphene in tension, 6) Multiresolutional continuum theory for heterogeneous materials, 7) 3D cell modeling based homogenization, 8) Alternative multiresolutional continuum theory, 9) IFEM based system parallelization, 10) Bridging scale between discrete and continuum media, 11) Nanoparticle effect on nanocomposites, 12) Applications of nanodiamond for cancer detection and drug delivery. To develop the ultra-high conductive silver paste, which is eco-friendly and recyclable, by application of carbon nanotubes and silver powders for high density electronic packaging and interconnections in electronic systems. Additionally, printable, stretchable, elastic hybrid CNT/Polymer interconnect with high conductivity will be developed for human interface electronic system. Low cost and eco-friendly electro-packaging process can be achieved by alternating the conventional interconnect materials to high conductive CNT/Silver pastes. Also, human interface electrical systems can be shortly developed by the key materials which are high conductive stretchable CNT/Silver pastes. 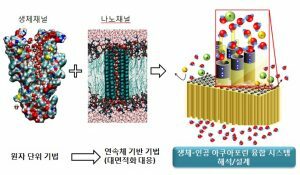 In addition, CNTs can be rapidly commercialized by obtainments of advanced manipulation and functionalization technology and multi-computational simulation technology developed though this study will be widely used for optimizations of nano composite materials. In this project, we suggest a new discrete modeling method based on mechanics which describes the system better in details than FEA continuum modeling, and yet has better efficiency in computational cost over MD. We set a hypothesis which can describe molecular, or atomistic motions in a way without spoiling its mechanical characteristics by using a simplified system called Elastic Network Model. To be more specific, we assumed that a linear spring connected to each atom can simulate atomic interactions inside a protein, or chemicophysical reactions between polymer matrix and nano particles inside nano composites. Setting a proper spring constant and elasticity modulus for realistic simulation is the key point of ENM to stand its ground for an alternative of FEA & MD. To verify this hypothesis, research goals are set as the following: 1) Get a spring constant through comparison of measured values at frequency experiment. 2) Construct an elastic network based on chemical constitution of system. 3) Develop FEA-ENM hybrid simulation method for multiscale computational mechanics analysis. 4) Development of a new molecular structure analysis method using frequency experiment results of a spectroscope and normal mode analysis results based on ENM.